Are you a personal trainer or coach looking to rapidly grow your business, make a bigger impact and create a brilliant lifestyle for yourself and your family? The Incubator programme is here, Purchase Today. Subscribe to the Incubator at £20 for your first month, then £99 per month. Subscribe to the Incubator for £990 p/y and get 2 months free. Why are you watching other coaches and trainers who are nowhere near as good as you taking all the credit and making all the money? I speak to passionate personal trainers who are struggling to fill their diaries or even worse they are filling their diaries with clients that they don't want to work with. It's time to create the business of your dreams, the business that allows you to live the lifestyle you want to live and make the impact that you are looking to make. Don't be left looking back wondering what could have been. The time really is NOW. Each month we meet online and do a deep dive into a specific element of your business that will allow you to attract more of the right clients, scale your business and give you the freedom you are looking for. The focus of these deep dive sessions is to give you a detailed blueprint into that area of your business that you can follow to generate more clients, build a sustainable business and generally ramp up your personal performance and business profits. Then you ruthlessly apply that information for the next 30 days and watch the results roll in. Get personalised coaching on your business each and every month. To help you even more you can access our Incubator support group where you can submit your personal questions and receive coaching on this each month from Brendan and the rest of the Strength and Success Team. That means that you can overcome all the challenges you have and make giant strides forwards where you had previously been stuck. This is about working smart, doing less and achieving more. You’ll learn the principles of how to build your business through being a part of the incubator but there is so much more to it than that. The reality is in today’s world things change so fast and you need to stay on top of it all. Our team will bring you the most up to date content each month and update you when things change. It's not about us giving you a ton of stuff to do, in fact it's quite the opposite. We give you ONE area each month fro focus on and you go away and nail that. Then you come back next month for the next piece of the puzzle. This way you can grow a sustainable business and stay on top of your game. Plus, this is a community. You’ll pick up valuable insights from the other members in the group and the growth process you’ll go through together is truly valuable. We have a fantastic track record of supporting fitness businesses you can’t fail to take giant strides forwards in the programme when you apply want you have learnt. Whilst you will experience rapid business growth by joining the incubator it isn’t going to happen overnight. We want to work with people who understand that success comes with hard work and dedication. We will teach you to build a real, authentic, profitable fitness business and support you whilst you do that over the next 12 months. But we can’t do the work for you! The incubator is £99 monthly for a 12 month period however you will get access for £20 if you register now for one of the opening group places. As the name of the programme suggests this is perfect for you if you are looking to increase your client base, leverage your time, increase your fees and build a profitable business quickly over the next 12 months. If you are currently at a revenue level of less than £8.5k per month, want to increase your earnings and are prepared to do the hard work and receive challenging feedback and coaching on how to do this you are absolutely in the right place. If you are a new trainer or beginner and have no clients or very few clients, you’ll still be a good fit for this programme if you meet the criteria above. We have an ‘essentials module’ which will get you up and running quickly and you can join the main incubator group when you complete this. So you definitely need to register your interest. This is not for you if you are already generating revenues of over 100K, we have a programme for you that is more appropriate (see the table below and register your interest there). Here’s a few examples of the types of people who are a perfect fit for the programme, you might fit one of these perfectly or you might be a combination of a couple of them. Y - You are an employed PT or coach looking to grow your client base within you club or go online and build your personal brand and train clients all over the world. What results will I get from the Incubator programme? Without question if you work hard over the course of the next 12 months you can expect to grow your business significantly and add many thousands of pounds to your end of year numbers. Being honest you won’t get any results at all if you don’t apply what you’ve learnt, unfortunately that’s the way the world works. It’s in our interests that you succeed because we want to get a great review from you and we want you to come onto our ‘Build and Thrive’ coaching programme which is for fitness businesses over £100K annual revenue as well as businesses that are setting up to get straight to that level. 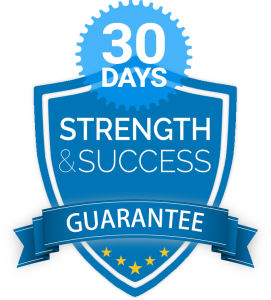 As always with Strength and Success you’re protected by our 10x value guarantee. That means that if you feel you’re not getting at least 10x the value of your investment you can cancel within 30 days and request a full refund. Who is it for? People looking for instantly applicable stratgies and tactics to add significant revenue to their business People with an existing business they are looking to grow significantly towards the £150k annual turnover mark People with a successful established business above £150k annual turnover they are looking to grow significantly in the next 12 months. Content of the mastermind sessions NA Information to help you accelerate your business and hotseat coaching for all members Evening networking and social the night before with the group members followed by hotseat style coaching, mentoring and planning throughout the main day. Why Join? Each deep dive session goes into detail on a tangible revenue stream that you can literally swipe and deploy in your business. You can to significantly and rapidly grow your business and yourself, you recognise that you want and need the best support available to make this happen You want to grow your network and influence in the industry. You already have a successful business and you are now looking to scale this business, achieve a highler level of profit and optimise your time so you can have greater freedom. You are also looking to grow your personal brand and influence in the industry to leverage your skills further. Key Themes addressed Tactics and tools that will add revenue to your business, new business opportunities, mindset and self development. Marketing, branding, sales, mindset, programme and service creation that will aggresively grow your business, along with how to apply them in your personal situation. Leadership, visionary thinking, systems and processes, finances, budgeting, hiring staff, planning, mindset and personal development. These are the key areas we will work on to build profits and scale your business along with your specific actions to go with these themes. What does that investment cover? All tuition and personal coaching sessions for the year. All tuition, personal coaching and mastermind days are included. You would need to factor in travel and accomodation for the event itself EVERYTHING! All tuition, personal coaching for the year and mastermind days are included. Accomodation is also included. You would need to factor in travel to the event, food and drinks whilst at the event. What’s next for people after this programme? You can join our Build and Thrive or Profit, Scale Freedom programmes which will take you from £70k up to £150k then you'll be eligible for our Profit Scale Freedom group which is for business owners over £150k turnover..
What if I have no clients? Don’t worry you can join us with the ‘Essentials Module’ which will bring you up to speed and help you get your first few clients.Then you'll follow the blueprint like everyone else on the programme. I work in a big box club chain, is this still right for me? Absolutely, provided you have a desire to grow your client base quickly and build a great business long term.